It is currently around 8pm in Tokyo and the protest is still going on. The organizers are estimating over 100,000 attending per Fukushima Diary. People have been asked to disperse and there are twitter reports the police have either left or given up on crowd control. IWJ has taken helicopter video to document the size of the protest that should be online soon. Last week’s protest was drastically under reported in size by the media. The fly over hopes to accurately document the size of the protest. This one appears far larger than the 45,000 last week. Soon after the disaster many were afraid to speak about their fears from the disaster at Fukushima or their growing opposition to nuclear power. 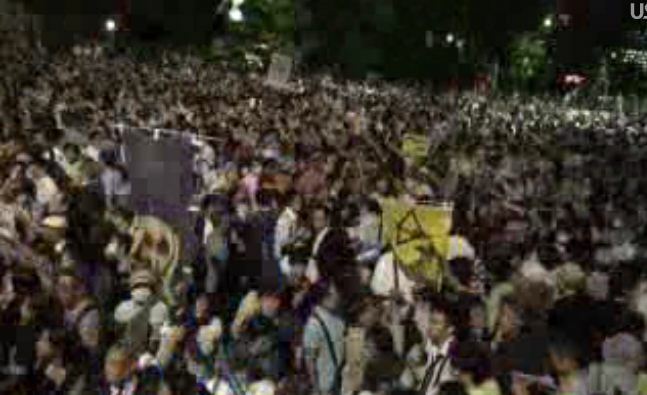 A little more than a year later the streets of Tokyo are jammed with protesters. Fukushima Diary has the live stream of IWJ and it seems to be working. IWJ’s website was inaccessible for many today.